Sounds like everything is in order indeed as the future takes seed. The IWSG has come a long way. I'm so grateful to be a part of this wonderful group. Many thanks to Alex for starting IWSG and to the whole IWSG team that makes it all run so smoothly! 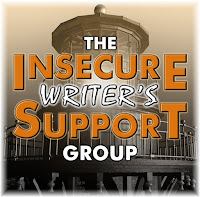 IWSG has helped shape my blogging and my writing. Thank you! I've met so many wonderful writers and great people through IWSG that I'm with the others in saying how much I appreciate the group and all of you who are in it. The stories are so great this year. It's going to be a great anthology. there are some great guests coming up. Gosh, the post title "The future of the IWSG" gave me a start! Glad to know everything is as great as ever and getting better every day:-) There are TWO facebook groups? Is there a reason for that? I joined one last week, does it matter which one? Looking forward to the guests and all the latest and greatest information - thanks, Alex! I was startled by the title of today's post, too. LOL. Which is silly, because you would have mentioned it first. Paranoid, much? Hope you pat yourself on the back, Alex. IWSG was your brain child and you've done it well. You are very organized Alex. You write very well, you're organized and you're a team player. I like that about you. LOL, too funny. Title gave me started too. I read with trepidation which is funny in itself, why is that the first reaction is oh no, what happened? IWSG is a wonderful community. Thank you Alex for creating it. I'm looking forward to jumping back into the IWSG posts, especially with all that it has going on right now! I'm glad there were so many entries for the anthology contest! I'm sure the judges have a difficult task ahead of them. The IWSG is a great group and I'm so happy to be a part of it!